Instrument Cabinets - Equipto Electronics, Corp.
Our price-leading Instrument Cabinets feature the same modular construction as our other enclosure lines. Instrument Cabinets are available in: aluminum or steel, 60 standard sizes, two widths, three depths and 10 heights. Standard EIA mounting angles ensure compatibility with your equipment. Instrument Cabinets are ideal for creating desktop systems such as testing and monitoring equipment. Instrument Cabinets feature strength, modularity, economy and they are available in 60 standard sizes. 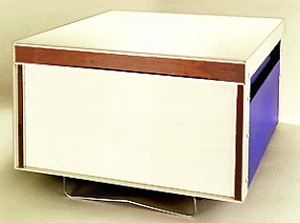 Instrument Cabinets are available in either steel or aluminum. Their thin wall construction allows maximum space utilization; and since there is no welding or grinding, the entire cabinet is made of only 4 parts. Custom size cabinets are available, please contact factory for specifics.